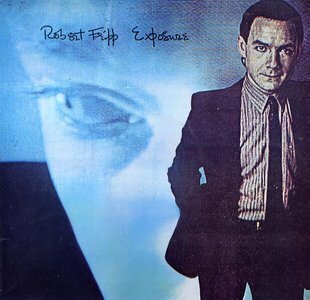 Robert Fripp is an extremely well-known musician and, it’s fair to say, an uncompromising one, as his entire career reflects. Known as a fleet-fingered (plectrum, please!) guitarist, ambitious composer and sonic experimenter, he’s left his fingerprints all over the musical world in ways that many, even avid listeners may not realize. He started by pioneering art-rock (prog-rock, if you will), with the gloriously overblown neo-classical mellotron suites of early King Crimson, becoming something of an intellectual hippie icon in the process. Then, when the winds started to change a little and the copycats were getting out of hand, he led Crimson bravely into the avant garde with the angular improvisations and apocalyptic sonic monoliths of Starless and Bible Black and Red. Eventually he ditched the band entirely (while helping out such luminaries as Eno, Gabriel and Bowie for larks) to become a one-man band, releasing the influential proto-ambient of Let the Power Fall, complete with liner notes that are a veritable sociological dissertation, featuring such lines as “My belief is that all political activity directed towards changing the means of working, is ineffective without a change in our way of working, and that this is essentially personal.” Eventually he formed the new-wave version of King Crimson and also continued to pioneer ambient music on his lovely but still challenging soundscapes albums. Fripp knew that things were changing, that a leaner, meaner future was on the way (as symbolized by punk, of course), but unlike other prog-rockers who stuck to their airy-fairy guns (remember, I like prog-rock, so that’s not a diss), Fripp embraced the stripping back of music to its basic elements. The album cover says it all. Scary TV or computer screen with ultra-serious and most definitely not hippie Fripp all put together and ready to conquer the eighties without mercy. The result from this maestro, however, is not trite, adolescent punk or post-punk stylings, but a maelstrom of the sounds of the potential future. And that gave us one of rock music’s most astonishing albums, Exposure. A concept album of a sort, or at least a unified suite of songs, on this album we find the jagged art-rock of mid-period Crimson smashing up against proto-punk, soulful ballads, pure ambient music and musique concrète. It’s a veritable template for some of the styles that would find success in the eighties. And each piece is delivered with intensity and panache. After a humorous intro in which a dry voice declares that the pieces to follow could be “commercial”, some dissonant harmonies and a ringing telephone, we suddenly flare into the full-on Chuck Berry-ish punk rock of “You Burn Me Up I’m a Cigarette”, sung by none other than Daryl Hall, with whom Fripp was working at the time. It’s worth noting that Hall and Oates were a pretty good soul combo in the seventies and Hall is a hell of a singer. So right away we know this is not going to be a pure prog-rock album. Almost reassuringly for the die-hards, though, the prickly instrumental “Breathless” is a piece that could have fit right on the Red album, but this time with added Frippertronics (the name given to Fripp’s tape loop system for guitar). The challenges keep coming with “Disengage“, another Red-esque piece, but screamed in a completely unhinged fashion by Peter Hammill, another prog-rocker who embraced the potential and ethos of punk and post-punk and won new fans in the process. Never known for vocal subtlety, Hammill seems determined to blow our eardrums out. Mission accomplished. Once again, the surprises keep coming with “North Star“, a gently swinging soul ballad with appropriately pretty vocals by Hall. A greater contrast between this and the previous piece simply would not be possible. Hammill is back for another soul/blues song, “Chicago”, before things get really weird on the avant-prog of “NY3”, which anticipates the sound of Primus by quite a number of years. A presumably real-life sampled argument between a New York couple is alternately funny and frightening as they bellow back and forth at each other. In another star turn, Terre Roche of the fabulous close-harmonizing folk sisters The Roches delivers a typically lovely but edgy (all at once) performance of “Mary”, a delicately picked ballad. Roche shows another side of herself (big time) on “Exposure“, which contains excerpts of Gurdjieffian philosopher J.G. Bennett speaking (“it is impossible to achieve the aim without suffering”). Almost robotically funky and overlaid with Frippertronic waves of ambient guitar, it also features Roche freaking out in some pretty crazy vocal explorations, at the top of her lungs. Fripp had a way of getting people to expand their boundaries! “Haaden Two” features more disjointed vocal samples and punishing avant-prog beats, while the following piece, “Urban Landscape” is pure Frippertronics that predicts the release of Let the Power Fall. Not pretty, reassuring ambient, it conjures visions of stained concrete towers under a rainy sky, as in the dystopian work of Ballard (High Rise). Hammill and Roche are back for another scream-fest on the delightfully titled “I May Not Have Had Enough of Me But I’ve Had Enough of You”. Sort of twisted hard-rock in which the screamers rearrange the words of the title until you feel they’re pulling your brain out through your ears. By this point in the track order Fripp may have realized that our intellects and eardrums have taken enough, so he moves the album in another direction entirely, in what I sometimes (often) feel is the best ten minutes of music ever recorded. Coldly, starkly lovely, but perfect nonetheless. “Water Music” is beautiful guitar looping and Bennett predicting a cataclysmic total flood of the world. Gently, Peter Gabriel’s piano ballad “Here Comes the Flood” (the link contains the whole three-part suite) joins in, just Peter’s voice and piano. It’s so different to the version on his first album, and in many ways much more effective without Ezrin’s bombastic production. Gabriel heart-wrenchingly brings out the sense of loss and sorrow inherent in the song. It’s one of the best performances of his long career and something you must not miss. Please, don’t. As if to sonically demonstrate the vibe of a drowned world, “Water Music” then resumes for a tranquil four minutes, effectively ushering out the album, but not before a postscript in which the host ironically declares “So the whole story is completely untrue. A big hoax,” then laughs. At us or with us, I’m not sure. Exposure is jam-packed with influential musical styles, as I’ve said (just look at all the tags!). It’s completely brave and completely successful as an artistic statement. Fripp wasn’t predicting the future, he was making it on the grooves of this record, which is an essential for any serious music collection. Sorry, that sounded snooty. But it is! This is an album worth owning, for real, so check out the below link. Actually, the “host” as you call him, speaking on tapes at the beginning and end of the album is not Fripp, but his pal “Captain” Eno. But, yes, this album is a scorcher I’ve loved in its various forms for 38 years now. Thanks for pointing that out. I knew it at one point but neglected it for the review.